Recombinant human fibroblast growth factor –acidic (FGF-1, aFGF ) is a single polypeptide chain containing 141 amino acids and having a molecular mass of 15.5kDa. The sequence of this recombinant protein is identical to natural aFGF, except it contains a methionine residue attached to the N-terminus. (b) aEGF rejuvenates both the epidermal cells and the underlying fibroblast cells, which produce collagen, elastin, and hyaluronic acid, maintain human skin elasticity, and decrease cutaneous senescence. (c) The proliferation of epidermal cells enhanced the skin cells regeneration. Angiogenic in vivo, stimulate cell proliferation on human vein endothelial cell, induce the formation of new capillary blood vessels. It binds to heparin, which potentiates its biological activity and protects it from proteolysis. 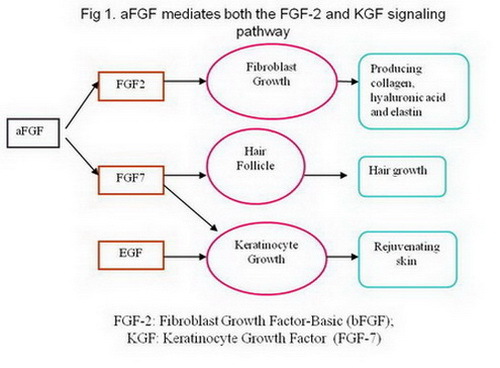 aFGF can activate FGF-7, promote hair growth by stimulation of cell proliferation on primary hair cell, treat or prevent baldness. It promotes DNA synthesis, stimulate cell proliferation and differentiation associated with wound healing, angiogenesis, tissue regeneration, embryogenesis and CNS development. Alcohol and iodine may probably destroy the characteristic properties of aFGF which lead to the decrease of its activity. The skin on which Alcohol or iodine are used should be washed with normal saline prior to apply aFGF. White or yellow-gray loose mass. Quickly dissolve after adding 1ml of distilled water and get a clear solution. Since the amount of aFGF added to cosmetics is very small, it is not suitable to directly add frozen dry mass to cosmetics. Trace dilution method is suggested which dissolve aFGF frozen dry mass having a known purity in a solvent at a temperature of 5-10°C and dilute with the same solution to have a concentration of 10ppm. The diluted solution may be stored in freezer of under low temperature. The diluted solution should be protected from being contaminated by bacteria since aFGF is easily hydrolyzed and losses its activity by enzyme produced by bacteria. MC-aFGF is relatively stable to temperature by adding special stabilizer in it. Still, we recommend that MC-aFGF is added to the formulation at a relatively low temperature (below 40°C). aFGF is sensitive to pH of cream. Prior to adding diluted aFGF solution to cream, the pH value of cream should be adjusted to 5-8. since at pH below 5 and above 8 and temperature 25℃, aFGF easily forms polymerid and losses activity. aFGF is easily decomposed by enzymes produced by microorganisms and loses its activity. So it is extremely important to avoid microbial contamination during processing of products containing aFGF as well as storage and transportation. The following ingredients may stabilize aFGF or potentiate its activity in formulation so may be considered in designing formulation.